Toilet servicing is offered for all portable toilets, not just for toilets supplied by us. If you've hired a portable toilet from another supplier for your construction or engineering site, ore even for an event and it's not being serviced then speak to a member of our team. Toilet servicing with Portable Toilet Hire London offers the best service with environmentally safe products. All toilets will be well stocked with consumables for the duration of hire and also regularly inspected by our team to ensure hygienic standards are met. The quoted price given includes 1 x weekly service for toilets supplied by us or for toilet servicing. We can also offer a toilet attendant for your event if required. Please contact our dedicated team at Portable Toilet Hire London to discuss your portable toilet servicing arrangements. 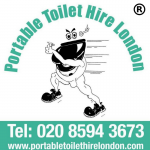 The portable toilets are delivered to your location in London, Essex and the surrounding areas.